No one pays to be on this list. Thanks to Kuztek for the custom web development of the dynamic filtering! Scroll to the bottom to use the Google Map feature. If something is missing or inaccurate then please comment below or contact me. Happy Hour offered daily from 4-6 PM and includes $2 off starters and $1 off draft beer and wine. Monday-Friday from 4-6 PM and includes several food specials, $5 beers, $7 cocktails, and 1/2 off wine by the glass. Available daily from 4:00-6:00 PM and includes featured appetizers and cocktails, 25% off wines by the glass, and $2 off draft beers. Monday-Saturday from 5-6 PM and includes $1 off all drinks and appetizers. Monday-Saturday from 4-7 PM and Reverse HH every night 10 PM- 2 AM. Daily specials including wings for $0.60 on Mondays, $1 Tacos on Tuesday, Half Off Apps on Wednesdays (from 4-10 PM), and more. Monday-Friday from 2-6 PM and includes half price on apps and drink specials. Monday-Friday from 4-6 PM and includes $4 drink specials and discounted appetizers. Monday-Friday from 3-9 PM and includes $1 off everything. Monday-Friday from 3:30-6:30 PM (All day Tuesday) and includes half prices app (excludes shrimp cocktail and antipasto) $3 coors light, $4 house wines, $3 wells, $3 domestics, $4 Moscow mules. Monday-Saturday from 3-6 PM for half price drinks and 3-5 PM for half price apps. Reverse HH from 9 PM-Midnight and is only for apps. Weekday happy hour (Tuesday–Friday) from 5-6 PM for half off all glass pour wine, Tuesday is all night happy hour for half off select bottles of wine, and Wednesday is all night happy hour for half off all draft beer. Tuesday-Sunday from 5-6 PM and all night on Wednesdays and Sundays. Includes food and drink specials. Tuesday-Thursday from 3-6 PM and Friday-Sunday from 11 AM- 3 PM and includes food and drink specials. Available every weekday from 2-6 PM including wine, beer, cocktail, and $5-$7 appetizer specials. Every day from open to 7 PM which includes getting four quarters back with every draught beer so you can play some games. Monday-Thursday specials that run from 4:30- 9 PM. Monday is buy one entree, get one half off. Tuesday is half price wines under $50. Wednesday is free appetizer with the purchase of a bottle. Thursday is half price wines under $50. Monday-Thursday from 3-6 PM and half off beers and appetizers. Monday- Friday from 4- 6 PM and includes $2 Busch and Bud light Tallboys, $2 New Amsterdam Vodka drinks, and $3 Jack Daniels drinks. Times vary by location, but generally it’s Monday-Saturday from 3:00-6:30 PM with varying weekend hours based on location. Thursday-Saturday from 5-6 PM and includes specials that change daily. Times vary by location, but generally Monday-Saturday 3-6:30 PM. Friday-Saturday 9:30-11 PM. Sunday Noon-8 PM (pretty much all day). Includes several sushi, appetizer, and drink specials. Monday-Thursday from 4-7 PM and includes $2 well drinks and Busch Light Bottles. Fridays from 4-7 PM include $5 pitchers of beers. Every day from 4-6:30 PM including drink and food specials. Monday-Friday from 3:30-6:30 PM in the bar with several foods and drink specials. Monday-Friday from 3-6 PM and Reverse HH from 10 PM-Close from Monday-Thursday including several food and drink specials. Tuesday-Saturday from 4-7 PM and Friday-Saturday Reverse HH from 10 PM- Midnight. Includes half priced wines and cocktails and $1 off beers. Also includes several $4-$7 appetizer specials. Monday through Thursday from 2-7 PM and includes $4 Session Series beers, Friday is half priced growlers all day (To-go consumption only). Saturday and Sunday specials include Bloody Mary’s and Beermosas for $5. Available daily from 4-6 PM at the bar with specials on drinks and appetizers. Monday-Friday from 4-6 PM and Late Night HH from 10 PM-Close. Includes beers on tap, cocktails, wines, and discount on appetizers. Available from 2- 6 PM daily and includes $4 Sakes, $5 beer and wines, $7 cocktails, and several discounted food items. From 4-5 PM every day several items are 30% off (except closed on Sunday). Available in the bar Monday – Friday 4-7 PM & 9 PM-Close. Saturday 11 AM – 5 PM. Monday-Friday from 3-6 PM in the bar. Includes half priced apps, house wines and martinis, and $1 off all other drinks. Confirmed this for both Omaha locations. Monday-Thursday from 3-6 PM at the bar (or patio) which is $1 off drinks and 1/2 price appetizers. Monday-Friday from 3-6 PM and all day Sunday and includes food and drink specials. Daily from 3-7 PM and All Day on Sunday. Offerings vary by location but includes food and drink specials. Monday-Saturday from 3-6 PM and Reverse HH on Friday-Saturday from 10 PM- 12 AM. Includes food specials and $1 off draft beer. Monday-Friday from 4-6 PM and includes $1 off drafts and discounted food specials. Monday- Friday from 3-6 PM and all day on Sunday includes $1 off pints, wells, drafts, and house wines and several food specials. Monday-Friday from 3-5 PM and includes a cocktail hour and 1/2 off appetizers. Also, there are daily food specials- see website for details. Mondays from 3- Close and Tuesday-Saturday from 3- 6 PM, Reverse HH on Friday and Sat from 9-11 PM. Includes $2 off all beers, $6 rotating cocktails, 25% off bottles of wine, and discounted prices on appetizers. Monday-Friday from 3-7 PM and includes $1 off all regular priced domestics/specialty beer and $1 off all well drinks. Daily specials also available- see website for details. Everyday from 2 PM to 6 PM and includes $2.50 Domestic Bottles and Pints. $3 Well Drinks. $5 Glass of Wine. Plus a specialty happy hour food menu including mini cod bites, appetizer sampler including the famous fried pickles, and a weekly slider option. Monday- Friday from 4-6 PM and Reverse HH on Friday-Saturday from 10 PM- 12 AM. Includes $2 off beer and $1 off wine, mixed drinks, and bar snacks. Monday-Friday from 4-7 PM and Saturday/Sunday from 11 AM-5 PM in the bar or patio and includes bar bites and drink specials. Half price wines on Monday (all day). 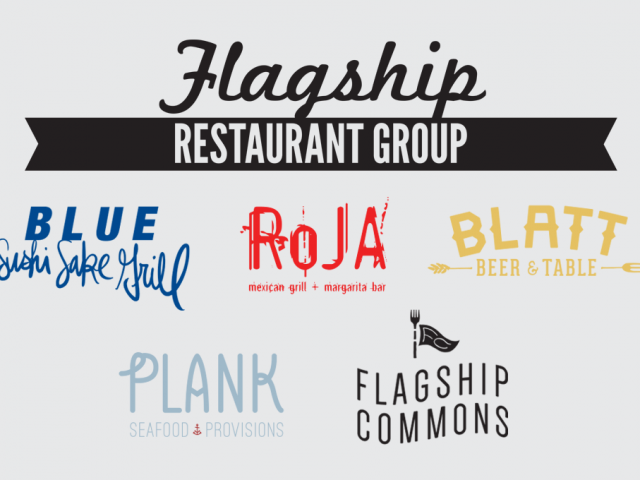 They have daily specials including $2 off Boulevard every Tuesday at Blatt, Half priced kids meals every Wednesday (no adult purchase necessary), Half off draft beers on Wednesdays at Blatt (and free pretzels with a sandwich purchase), and Vegan Thursdays which includes a discount on vegan offerings at all the restaurants. Every day from 5-7 PM select drinks/appetizers half off and some HH entree specials. Monday-Friday from 4-6 PM and all day Sunday. Includes half off appetizers, half off pizza, and $1 off wells and drafts. Monday-Friday from 3-6 PM and Reverse HH from 9 PM-Close. Specials on $4-$5 cocktails/wine and $5 appetizers. Monday-Friday (all day Sunday) from 4-6:30 PM and includes $1.50 off appetizers and $1.50 off full-sized beers. Daily until 7 PM and includes $7.50 Busch, Miller, and Bud Pitchers, $3.50 Well Drinks, and $2.75 Domestic Bottles. Monday-Thursday from 3- 6 PM and Friday-Saturday from 10 PM-12 AM. Includes food specials, $1 off beer, $5 wine by the glass, and $6 cocktails. Daily from 5-7 PM and includes $2.00 domestic beers, $3.00 craft beers, $3.00 premium well drinks, $3.00 off wine by the glass, $2.00 off all other liquor, $4.00 appetizers, and $6.00 specialty craft cocktails. Tuesday-Saturday from 3-6 PM, reverse HH on Friday and Saturday from 9- 11 PM, and all day Sunday. Monday-Friday from open (5 PM) until 7 PM and includes $0.50 off everything- higher priced items are discounted more. Tuesday-Friday from 3-6 PM and includes $4 Bavarian Pretzels, $1 off draft beer, $4 well drinks, and $4 house wine. Monday-Friday from 3-6 PM and reverse HH on Friday from 10 PM-Midnight. Includes $2 off cocktails, $1 off beers, select $4 small plates, and $2 off Ramen. Happy Hour daily from 3-6 PM and includes $3 beers and $5 Old Fashioneds and Daiquiris. Monday – Thursday from 4:30- 6:30 PM. The way it works is that you pull tabs on your round of drinks. One card is $1 off, one card is for half price, and the remaining three cards are full price. Gamble your luck! Every day from 1-7 PM and includes $1.75 PBR Cans, $3 Busch Light bottles, and $3 Domestic bottles. Also daily specials- see website for details. Monday- Friday from 4-6 PM including food and drink specials. Monday-Friday from 4-6:30 in the bar and includes $2 oysters on the half shell, $3.50 Lobster Claws, Apps starting at $6.50 and $7 drink specials. Monday-Friday from 3- 6 PM includes $1 off wine, $2.50 Budweiser, $2 off Margaritas, and discounted appetizers. Monday- Friday from 3-6 PM and includes food and drink specials. Offers vary slightly by location so check on the link. Monday-Friday from 4-5:30 PM and Saturday/Sunday from 4:30-5:30 PM and includes entree specials. Every day from 3-5 PM including several appetizers that range from $3-$4 each. Every day from 3-6:30 PM, all day Sunday, and reverse HH from 9 PM-Close. Downtown: Tuesday-Friday from 3-6 PM with half off wines on tap, half off on snacks/apps, and half off of the soup + grits. Dundee: Monday-Friday from 2-4 PM with half off appetizers. Monday-Friday from 3-5 PM with food specials from $6-$8 and drink specials from $4-$6. Monday- Friday from 5-6 PM and Saturday/Sunday from 4:30-6 PM including drink and appetizer specials. Monday- Friday 2-7 PM and reverse HH on Monday-Thursday from 9-11 PM. Friday-Saturday from 9 PM-12 AM. Sunday all day. Includes several $5 food specials and $5 cocktails. Monday- Friday from 4-7 PM, Saturday from 12-4 PM, and Sunday from 11 AM-4 PM. It includes $1 off All American craft beers, $1 off bloody Mary’s, $3 Mimosas and $4.25 premium wells. Monday-Thursday from 3-5 PM and 8 PM- Close includes several food and drink specials. Monday-Friday from 3-6 PM (Lincoln locations are only in bar/patios) and reverse HH in the Haymarket location in Lincoln on Friday and Saturday from 9 PM-Close. Offers vary by location, check website. Tuesday- Saturday 3-6 PM and includes $1.25 oysters, several food specials, and $5 drink specials. Monday-Friday from 3- 6 PM and Sunday 11 AM- 5 PM. Including house cocktails for $5, $5 off bottles of wine, and several other drink specials and $1 off appetizers. Monday-Friday from 4-7 PM there are several drink and food specials. Daily food and drink specials- see website for details. Monday- Friday from 3-6 PM and includes $1 off wells, cocktails, draft bottle beers, wine and $6 appetizers. Reverse HH is on those same days from 9-11 PM. Tuesday-Saturday from 3-6:30 PM and Sunday from Noon- 8 PM. It includes food and drink specials- see website for full menu. Monday- Friday from 4-6 PM includes half-priced appetizers, $5 well drinks, and $5 house wines. Monday-Thursday from 4:30-6 PM and includes several $4 apps, $1 off beer, and $1-$2 off cocktails. Every day they offer half price wines from 2-5 PM (until close on Mondays and Tuesday). Tuesday-Saturday from 3-7 PM and includes several discounted food items, $6 select wines, and $6 select cocktails. Also, half price bottles of wine on Tuesday and Saturday. Tuesday-Friday from 4:30-6:00 PM and includes $3 house margaritas, $5 apps, and $1 mini tacos. Every day from 4-6 PM and all day on Mondays. Select cocktails are 1/2 off and on Wednesdays all whiskey pours are 1/2 off as well. Every day (except Sundays) from 3-6 pm and includes $3 off all beer, discounted cocktails and wines by the glass, and $3 off all appetizers. From 4- 5:30 PM Tuesday- Friday and includes 10% off dinner menu food items, half off wines and $4 draft beers. Monday-Saturday from 12- 6 PM for discounted food and drink specials. Sunday from 2pm-Midnight with only drink specials. All day on Mondays and Tuesday-Friday from 2- 6 PM and includes food and drink specials. Monday-Thursday from 5-7 PM and Friday-Sunday from 3-7 PM including several food and drink specials. Everyday from 4-6 PM and Friday and Saturday Reverse HH from 10 PM-12 AM. Includes $2 off wine by the glass, $4 domestic and wells, $5 house wine, $6 select martinis and cocktails, and $5-$7 food specials. Monday- Friday 4-6 PM and Reverse HH is every day 10 PM-Close, $3 pints for normal draft beers, $4 wells, and several food items. Monday-Friday from 3-6 PM and all day on Sunday. Happy hour includes appetizer, drinks, AND entrees. Monday- Friday from 3-6 PM and all day Sunday and includes several food and drink specials. Monday-Friday from 4-6 PM including $1 off draws, $1 domestic bottles and $1 off domestic pitchers with food specials starting around 5 PM. Monday-Friday from 4-7 PM and includes $1 off most drinks. Saturday & Sunday from 2- 6 PM and includes half-priced draft beers. Tuesday-Friday from 3-5:30 PM and all day Sunday. Includes $4 Margs and Sangrias, $3 beers, $2 Tacos, and $5 Apps. Thursday-Saturday from 7:30-9:30 PM and includes $2.50 domestic bottles, $3 import bottles, $3.50 house wines, $4.50 margaritas, and $6.50 unlimited mimosas. Appetizers are also available between $3-$6. Happy Hour from open- 6 PM daily (see website for opening times). Specials include $3 domestic draws, $4 craft pints, and $3.50 well drinks. Daily food specials available- see website for details. Monday-Friday from 3-6 PM dine-in only and includes several food and drink specials, including half off wines in the $40-$90 price range. Pizza and a bottle of wine starting at $30. Monday-Friday from 3-6 PM and includes $1 off drinks and 1/2 off appetizers. Reverse HH on Saturday from 8 PM-Close. Daily specials included- see website for details. Monday-Saturday from 4-6 PM and Reverse HH from 9 PM-Close. $1 off draft beers and $1 off well drinks. Available in bar or patio dining areas. Monday- Saturday from 3-6:30 PM, Sunday from Noon- 8 PM. Every day from 3-6 PM and includes drink specials, appetizer specials, $5 rolls and $8 rolls. Reverse HH on Friday and Saturdays from 9-11 PM. Daily from 3-6 PM and includes domestic buckets of 6 beers for $13. Daily food specials included as well, click here. 3:30- 6:30 PM every day and reverse HH from 9 PM-Close on Friday and Saturday. Monday-Friday from 4-6 PM and includes discounted appetizers that range from $3-$6 and $6 entrees. See photo here found on Yelp. Monday- Friday from 3-6 PM, Saturday from 11 AM-5 PM, and all day Sunday. Includes house wines for $3.50, $1 off other wines, $1 off mimosas, and discounted select food items. Daily from 3-6 PM and reverse HH from 11 PM- Close and includes beers, wine, well drinks, and bar snacks. Tuesday-Saturday, 11 AM- 6 PM and all day on Sunday and Monday. Includes $0.75 off all drinks and beer and $2 off all pitchers. Daily Specials available, see website for full menu. Monday-Saturday from 3-6:30 PM and Friday-Saturday from 9:30-11 PM. Monday -Saturday until 7 PM and all day Sunday including food and drink specials. Select tacos for $2/each all day on Tuesday and deals on beer and margaritas. Every day from 5-7 PM and includes rolls from $2.95-$7.50. Monday-Friday from 4-6 PM with tons of drink specials. Monday-Friday from 3-7 PM and includes discounts on Domestic buckets, bottles, draws, and well drinks. From 2-6 PM every day including food and drink specials. Monday- Friday from 3-6 PM and includes $5 Moscow Mules, 50¢ off draws, $4 Captain Morgan’s, $1 off any glass of wine, and food specials. Every day from 3-6 PM $1 off domestics, $1 cherry limeade, and $1 off cocktails. Reverse HH from 9 PM-Close on Friday and Saturday. The Dodge Street location offers (in addition, I believe) $3.99 burgers and 1/2 off appetizers. Daily from 2-4 PM and includes 1/2 priced drinks and slushies and $0.99 corn dogs. Every day from 4-6 PM including $5 and $8 appetizer specials and $15 entree specials. Every day from 4-6 PM throughout the entire restaurant (except party rooms). Anything by the glass is half off and flatbreads are half off. Monday-Thursday 2-5:30 PM and includes $3 beers on taps or mixed drinks, $4 glasses of wine, $5 mini pizzas, $3 rosemary flatbread trio, or $5 glass of any 3 sangrias. Monday- Friday from 4-5 PM Most taps are $2 and $2 Jamison shots. Every day from 4-6 PM including $1 off drinks and half priced appetizers. Every day from 2- 6 PM including food and drink specials. Every day 3-6 PM, All Day Sunday, and Reverse HH from 9- 10 PM. Includes $3 for local brew draws, margaritas starting at $3 and various appetizers/drinks. Every day from 3-6 PM and all day on Sunday. Includes several drink and appetizer specials. Monday- Friday from 3-6 PM and Thursday from 3- Close. Includes $7 Signature Martinis, $1 off Draft Beer, and $7 bar bites (some excluded). Tuesday- Friday from 4-6 PM and includes $1 off appetizers, margaritas, Mexican beers and any tequila shot. Taco Tuesday specials are 2 tacos for $7 and 3 tacos for $10 and runs all day on Tuesdays. Monday-Friday from 3-6 PM including food and drink specials. Monday-Saturday from 3-6 PM including food and drink specials. Monday-Thursday from 4-6 PM including specialty drinks starting at $4, discounted domestic beers, and entrees starting at $9.49. Monday-Friday from 3-6 PM and includes $1 off all balls and beers. Monday-Wednesday from 2-6 PM and all day Sunday and includes $1 off drinks. Monday-Thursday from 4-6 PM (all day on Tuesday) and includes $1 off draft beers. 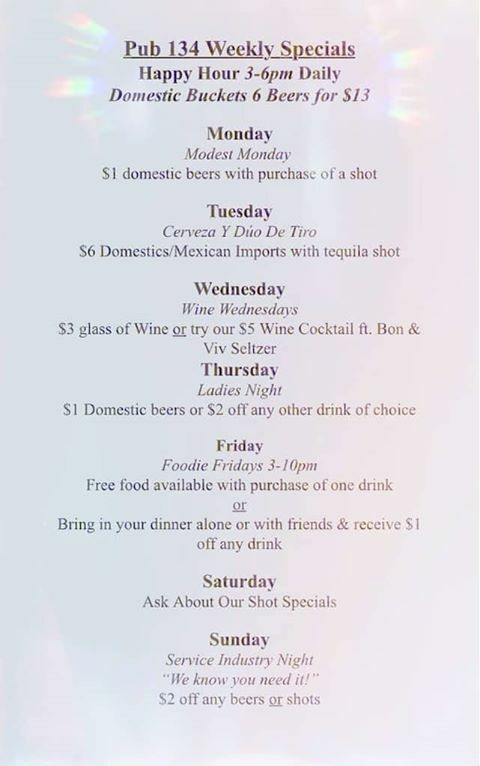 Monday- Friday from 4-6 PM in the bar including specials on drinks (several $6.50 cocktails) and $6.50 appetizers. Daily from 3-6 PM includes $2 Domestics, $3 Frozen Margaritas, $4 on the rocks Margaritas, and $1.50 street tacos. Reverse HH from 9-11 PM. They also offer daily food specials found here. Monday-Friday from 3-7 PM and includes $12 domestic buckets, $3.50 Well, $4 Bombs, and $2.50 Domestic Pints. Daily food and drink specials offered, see website for more details. Monday-Friday from 4-6 PM and 11 PM- 1 AM. Discounts on beer on tap, premium wells, 1/2 off cocktails and 1/2 off wine by the glass. Reverse Happy Hour from 11 PM- 1 AM every night. Every day from 4-7 PM and includes $1.50 street tacos, $2 domestic bottles, $3 wells, and $4 margaritas. Wednesday-Friday from 4:30-6:30 PM and includes $1 off drinks and daily specials on those days. Monday-Friday from 2-6 PM and includes drinks from $3.50-$5 and apps from $3-$5. Every day 3-7 PM $1 off bottles, draws, wells, and calls. Monday-Friday from 3-6 PM and all day Sunday. Includes $0.50 off domestics and wells. Monday-Friday from 3-5 PM and includes 20% off beer. Monday-Friday from 3-6 PM and includes several drink specials. Every day from 2-6:30 PM and Sunday from 2 PM- Close. Reduced pricing on most appetizers including pizzas. $1 off tap wine and $2 off wine by the glass and several other drink specials. Monday-Saturday from 4–6 PM and includes $3 well drinks, $3 beers (domestic, specialty and imports) and $3 off each glass of wine. Monday- Friday from 3-6 PM. Specials $5 wines, $4 Stella Artois, and $1 off other specialty drinks. Every from 3-5:30 PM and all day Sunday includes $5 red or white house wine, $6 draws, $4 on tap pint and various appetizers. Monday-Saturday from 3-6 PM and reverse HH from 9 PM- Close and includes $5 food specials and drink specials ranging from $3-$6. Monday- Friday from 3-6 PM and all day Sunday. Includes $4 domestic mini pitchers, $2.50 draws, $3 domestic bottles, $3.25 wells, $3 Busch Light tall boys, and select $5 appetizers. Friday Happy Hour from 3-7 PM including half off apps and various food specials throughout the week. Every day from 3-6 PM except Saturday. Includes select $4 apps, $3 house wines, $3, and $4 wells. Monday-Friday from 3-6 PM and all day Tuesdays. Specials include $1 off full pour beers and $2 off growler fills to go. Monday-Friday from 2-5 PM and includes $3 for chip and queso or $3 margaritas. Monday-Friday from 3-6 PM and all day Sunday. Includes $1 off all craft/import beers, $3.75 domestic bottles, $4.75 wells, $7.50 signature martinis, $2 off all other house cocktails. Also included at $8, $6, and $4 select appetizers. Monday-Friday from 2- 6 PM, 10 PM- 2 AM on Monday-Wednesday, and all day Sunday. 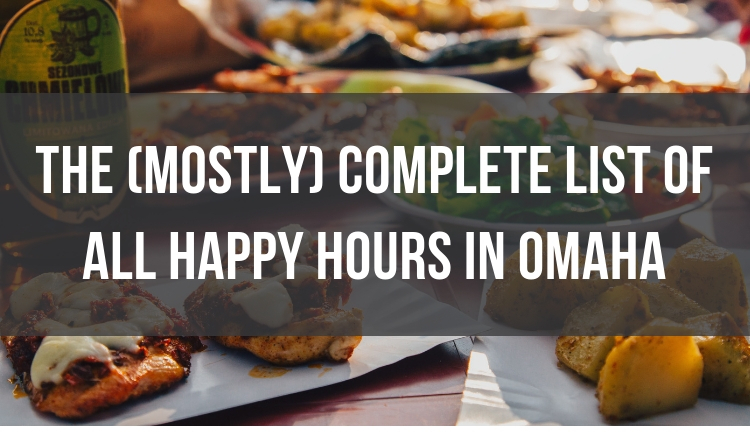 Am I missing any Omaha Happy Hours on this list? Let me know! 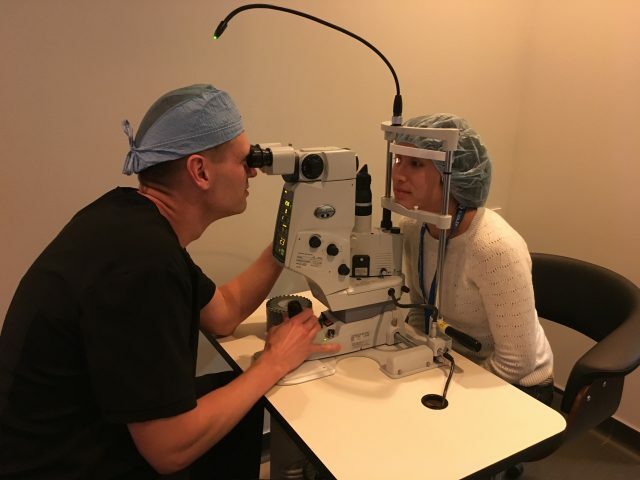 What’s It Like to Have LASIK Surgery? You Rock Cam! For so many fabulous reasons !!! We should get together for happy hour soon! Thanks Ed, they’ve been added to the list! I’ve added you to the list and map, thanks for the tip! Best place for wine on Wednesday? ??? Beercade has happy hour every day from open to 7pm. You get four quarters back with every draught beer so you can play some games. Yoshitomo has happy hour at varying times (see https://www.sushiyoshitomo.com/menu/) with all kinds of discounted items, and although it doesn’t say so on their website, they will also apply the discounted prices to any delivery orders placed during happy hour. Thank, Joe! These have now been added. Check out Kona’s revised Happy Hour times and menu! Called Kona just now and I’ve updated accordingly, thanks for the tip! Love this list of Happy Hours! Thank you! Thanks for using it Janae! I am the bar manager at the new Hilton Garden Inn at Aksarben Village. I have drink specials daily! From 5-7pm. $2.00 domestic beers $3.00 craft beers. $3.00 premium well drinks. $3.00 off wine by the glass. $2.00 off all other liquor. $4.00 appetizers and $6.00 specialty craft cocktails. Boom! I’ve got you added! As a broke college student new to the area I cannot thank you enough for this list. THANK YOU!!! Kyle, glad it was useful for you! Welcome to Omaha! Thanks for the tip, Jim! Updated now on the list and map. Updated on both the list and map, thanks for the tip!